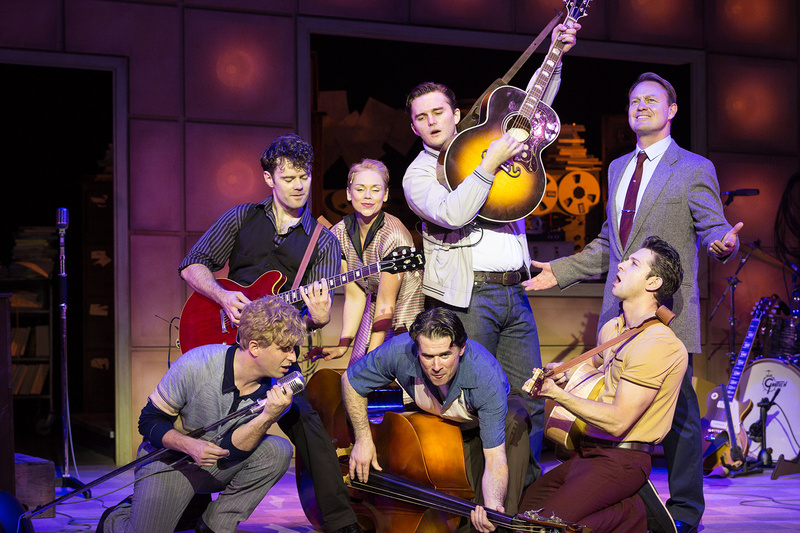 Million Dollar Quartet tells the story of the December night in 1956 that Elvis Presley, Johnny Cash, Jerry Lee Lewis and Carl Perkins came together for the first and only time, in the studios of Sam Phillips, founder of Sun Records. 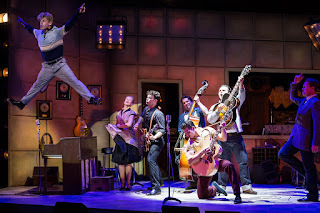 Phillips, in the guise of former Blue Peter star, Peter Duncan, is something of a musical Svengali, having shaped the careers of Presley, Cash and Perkins from his two-man company. His next prodigy, the brash, arrogant and uniquely talented Jerry Lee Lewis is in the studio to try to help Perkin's find his next hit record. Phillips gives him two minutes to impress – with his version of Wild Child, Lewis blows everyone away in 30 seconds! 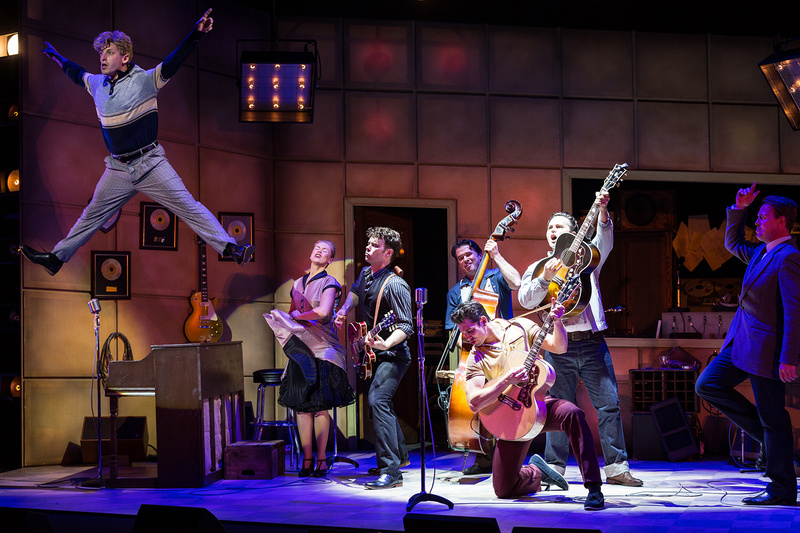 Ashley Carruthers, making his UK theatre debut delivers an exquisite performance as Lewis, blending physical and verbal humour with extraordinary musical talent. His verbal sparring with Perkins, borders on playground banter, but for Lewis, a man twice married by the age of 20, it feels authentic enough! 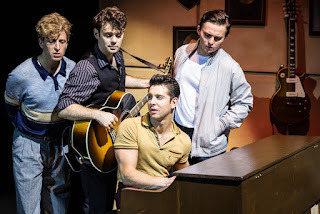 The pair are joined by Robbie Durham in the role of man in black, though strangely in blue in this performance, Johnny Cash. 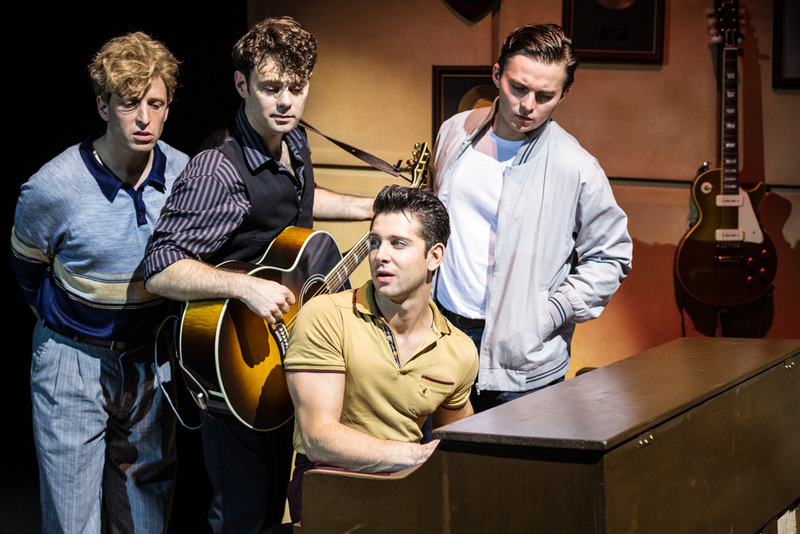 From his first contribution to vocals in Blue Suede Shoes, Durham showed he clearly has an exceptional voice, hitting low notes so effortlessly that whilst he wasn't breathless, much of the audience was. For me, whilst Carruthers had the more exciting songs and the scripted laughs, it was Durham who gave the stand-out performance. Finally enter Elvis Presley, Ross William Wild, accompanied by Hollywood actress girlfriend, Dyanne. 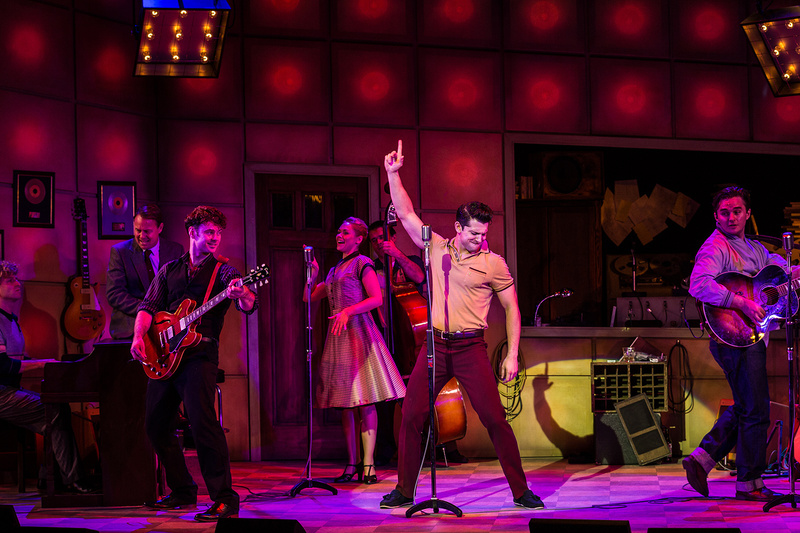 Elvis has returned to ask Phillips to help him with his career but meets resentment from Perkins and it is at this moment that we understand the importance of the opening number, Blue Suede Shoes. It transpires that Blue Suede Shoes was Perkins' breakthrough hit record, but when he is injured en route to New York, Elvis performs the song on the Ed Sullivan Show. From that moment, the song is lost to him and for evermore it's Elvis's song and Perkins career stalls. knows Elvis so much more than the others. The voice is good, the movement is mostly there, but something is missing. To be fair I don't suppose there is anyone out there who looks, moves and sounds just like a young Elvis in his prime, and I wouldn't want to be overly critical. Initially it seems that there is no need for a plot at all, as this show stands on some excellent musicianship, wonderful vocals and energetic performances of the back catalogue of these legendary performers. But plot there is, and it is skilfully and succinctly communicated through some excellent short passages of dialogue as the hits keep coming. The relationships between all the central characters are tested and I don't want to give the plot away, but there is genuine pathos amongst the exuberance. Peter Duncan keeps the plot moving along but isn't really tested in the role. The staging is simple but effective, the lighting good and the sound, all of which was live, was excellent. Ultimately, the music is central to the show and there are many great hits for fans here as the four great stars jam together - Blue Suede Shoes, Fever, That’s All Right, Great Balls of Fire, Walk the Line, Whole Lotta Shakin’ Goin’ On, Matchbox, Folsom Prison Blues, Hound Dog and more. By the end the whole audience was on its feet and dancing. For anyone with any interest in Rock ‘n’ Roll, it's a great show! Highly recommend.